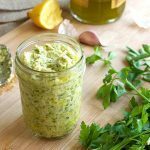 This marinated artichoke pesto recipe is a fantastic spring and summer sauce. It’s light, it’s fragrant and it’s a touch zingy, with just a hint depth from the marinated artichokes. Place everything in a chopper and chop to a coarse mix, scraping down and mixing a couple of times. The pesto might be a little heavy on the salt when tasted. Don’t forget that when it’s mixed in with pasta, it will need all that salt. In fact chances are, you’ll have to add more after mixing it with pasta. Nutritional information is just for the sauce only, as used with pasta. It does not take into account the pasta itself. 2-4 servings will depend on whether you are serving it as a starter or main.